I cannot control my excitement. As we’re finishing up this brilliant season of my new favorite television show, there are just so many possibilities for how this one is going to end. I’m looking too far ahead, though, as we still have to discuss the penultimate episode. The format of the show is now in new territory, as the interviews have come to a close, so too have the flashbacks to the benchmark years of the story: 1995 and 2002. 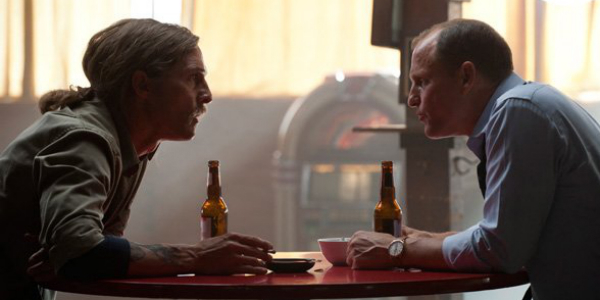 Now, we’re fully immersed in 2012, with an off-the-deep-end Rust Cohle and a flabby, hairless Martin Hart. While Rust spent the better part of the decade trying to disappear, only to have the Dora Lange case drive him back to Louisiana, Hart’s life as a detective sputtered out, until he started his own private investigation firm. The idea of a circular timeline comes into play in this episode, as the men, after all they’ve been through and after all the time that has past, find themselves revisiting the case that essentially defined their careers and aided in their own self-destruction. It remains to be seen whether or not they’ll keep coming back to it, unable to get full closure on such a complicated case. To Cohle’s credit, he’s spent the better part of the past few years diving headlong into a second investigation, weaving in and out of society virtually unnoticed. For him, all signs point to the Tuttles, the Yellow King, and the Spaghetti Monster. 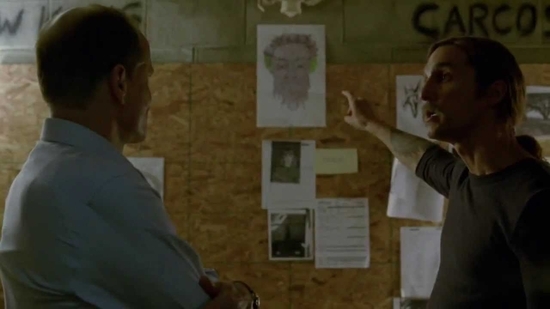 Through Cohle’s extracurricular activities, he’s been able to find some damning evidence, no matter how speculative it may remain. All signs point to a near cultish underbelly of some of the most powerful people in the area and it could mean that the two have bit off more than they can chew. What I love about this show is that it was exactly what I wanted it to be. I was hoping for a show version of Zodiac, in which the investigation eats at them for years, until they wind up changed men at the other end of everything. The execution is near flawless; the tone is so dark, so humorless that it simply encapsulates the true bleakness of the series of events. It can be a cruel world sometimes, and these two men have to look that cruelness right in the eye.